Visit Comp and Save online at CompAndSave.com, previously BookAndSave.com, which specializes in providing quality printer inkjets cartridges, laser toner, printer accessories and peripherals at deep discounts. 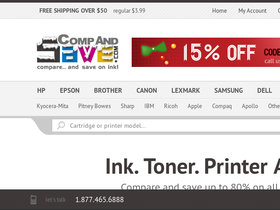 CompAndSave.com will continue to increase its discounts as the Internet's support grows. Check 58Coupons.com for the latest Comp and Save discounts, Comp and Save savings, Comp and Save promotions and Comp and Save coupons available for Compandsave.com. Discount of $15 on combo pack orders over $65 from Comp and Save with this coupon code. Enjoy free shipping with your online order of over $50 or more from Compandsave.com. New Customers receive $20 savings on orders over $120 from Comp and Save with this coupon code. Enjoy a $10 discount on purchases over $60 from Comp and Save with this coupon code. Just use this coupon code on CompAndSave.com and you can save 10% off your order. Check out the Promotional Sale page at Compandsave.com and find savings up to 60%. Save $5 on combo packs orders over $30 from Compandsave.com with this promo code. Click link to get started. New customers, save $10 on orders over $60 or more with this coupon code from Compandsave.com. Right now new customers will save $5 on orders over $30 from Comp and Save with this coupon code.